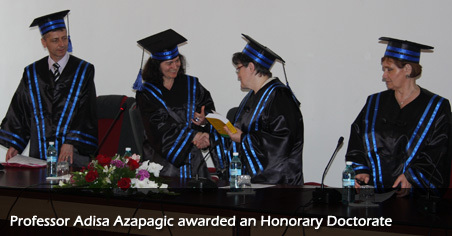 Professor Adisa Azapagic has been awarded an Honorary Doctorate Degree from the “Gheorghe Asachi” Technical University of Iasi, Romania, for her contribution to Sustainable Engineering. At the award ceremony held at Iasi, Professor Azapagic gave a talk entitled “Sustainable engineering – shaping our future”. “I am delighted to welcome Professor Azapagic to the University as our colleague and I look forward to our continued collaboration in the years to come”. To download the presentation that Professor Azapagic gave during the award ceremony click here. Download the citation for the award (in Romanian) here or visit www.tuiasi.ro/evenimente/profesorul-adisa-azapagic-de-la-universitatea-manchester-doctor-honoris-causa-al-tuiai.